If you’re looking for a change from your ordinary weeknight menus – look no further! When I first saw this recipe, I knew I wanted to make it because it would really add a lot of interest to our normal weeknight menu rotation. While being very unique, it doesn’t call for a bunch of crazy ingredients – you could find everything at Walmart if you wanted. I was a little worried John wouldn’t like this since it’s not your typical American fare, but to my surprise I think he liked it even more than me! 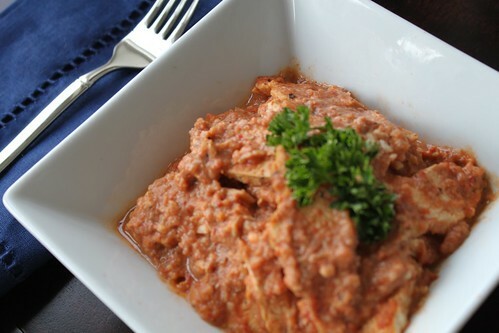 It has a smokey flavor, and yet is a little bit creamy because of the ground almonds used in the sauce. When planning meals for the week, I put Spicy Bean Burritos on the menu, because they also call for chipotle peppers in adobe sauce, and that way I knew the can I bought wouldn’t go to waste. If you like your dinner on the spicy side, then use the entire chipotle pepper. Personally, I like just a hint of heat, so I removed the seeds from the 2 peppers I used, which really cuts down on the spice. I also happened to have some corn tortillas left over from Chicken Enchiladas , so that helped to cut down on ingredients to buy (corn tortillas last forever, or so it seems). The recipe makes a lot of sauce, so it could really accomodate anywhere from 2 – 4 large chicken breasts. If you don’t want to make the whole batch, just freeze the sauce and use it over some leftover chicken at a later point in time. We ate it plain, but I’m planning on serving the leftovers over some cilantro-lime rice, yummmm. Preheat oven to 450°. 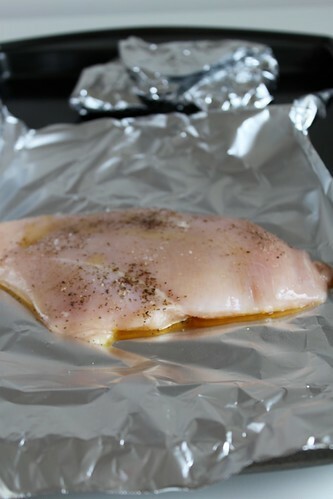 Sprinkle chicken with salt & pepper and wrap, individually, in tin foil to keep the chicken moist while baking. Place on a cookie sheet and bake for 25 minutes. Slice into strips. *This can be done up to a day ahead of time. As an alternative, you could poach the chicken breast in water for 15 minutes, or use leftover chicken breast from another meal. 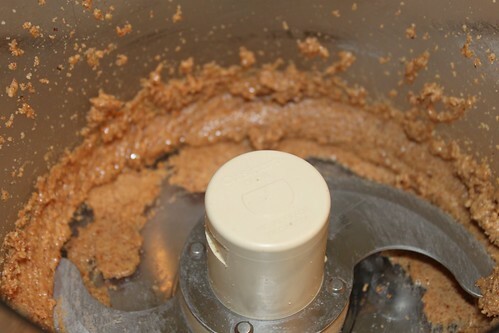 Place the almonds in a food processor and process for 2-3 minutes or until smooth (it takes a little bit of time, but should end up looking like peanut butter). Keep in the food processor. In a large skillet heat oil on medium heat. Add the chopped onion and garlic cloves. Sauté for 3-4 minutes. Add the rest of the ingredients through broth: tomatoes, chipotle peppers, sugar, cumin, salt, cloves, tortillas, vegetable broth. Bring to a boil, then reduce heat to simmer for 15 minutes. Add the tomato mixture to the food processor with the almonds. Also add 1 T. vinegar. Puree mixture until smooth. Return mixture to pan and add the chicken to heat through. Serve over rice if desired. This entry was posted on April 1, 2011 by Spice Is Nice. It was filed under Main Dish, Poultry .